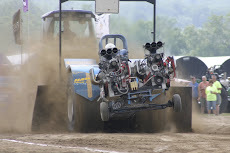 Alexander Steam show pull was Friday night; the track was extremely wet down a couple feet. The top looked good but it was spongy, when the equipment went drove on the track it would dip down for several feet around the wheels, and then pop back up after the equipment passed. They had to use an articulated John Deere tractor to help pull the sled back. The Super Farms and LSS ran first, each tractor succeeding tractor went a little farther down the track. The next class should have been the TWD but the track officials decided to run the Mods. Don Telack had a nice run down the left side of the track, the new motor from Jim Sieranga on the back really made a difference with the tractor. John Duggan was 2nd hook he had a nice run going until the tractor hooked right. I was the next hook; I pulled all the weights off the front. During the week I had done some work and changes to stop the right front engine coupler from coming on done, and also had found that the clutch damage done at Fergus had caused the throw out bearing to hit the cross shaft. I am not sure why after several years but something changed in the clutch, so I removed the cross shaft. So I had high hopes for a turn around in what had been going on since mid season. I came out easy, felt the tractor “hook up” then open the throttle as the track allowed. The hook up felt front pickup felt smooth and momentum was good. At about 100 ft, I was thinking this feels really good, tractor is going perfectly straight not drifting at all, no hopping or bouncing. Just after that I noticed some smoke from the left side of the back engine, for a “brief” second I considered not shutting down but I did. By that time, there was a lot of oil and I knew I had a problem, so I just shut off the kill switches rather than shutting off the fuel. Jeff Lucky the photographer handed me a push rod off the track, so I would imagine the block is badly damaged. I loaded up and came home. I left the tractor on the truck and left for Watkins Glen Saturday morning for my daughters wedding. Sunday was beautiful not a cloud in the sky, she was married on the balcony of the pavilion in Watkins Glen. Monday morning we will head home, I will pull the motor and see what it looks like inside. I will send it up to Billy Leverentz at Oddy’s; he does beautiful work on his repairs at a reasonable price. I have a spare motor setting home and Chaffee is next weekend. I missed a hook at Holly on Sunday so Chaffee will not have any affect on my points finish so I will not change motors and go to Holly. The Chassis has been working really good, the engines have been running strong, if I had not had an issue with the coupler on the right engine mid season I think the season would have been outstanding! The positive side is there is next year.